OLD PARKED CARS. 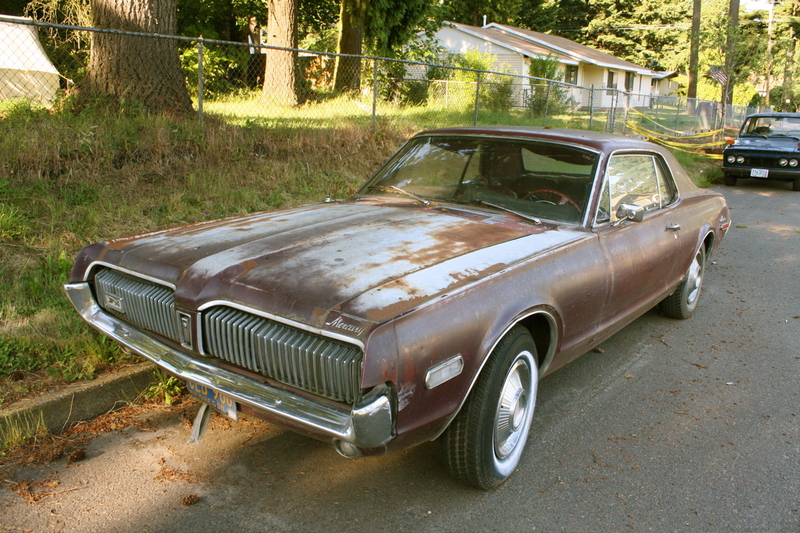 : 1968 Mercury Cougar. The hidden headlights incorporated into the grille is so great. I believe that's a '68 Cougar, not a '69. fair enough, jeff. how can you tell? I think this is the only car to sport matched front and rear lights. Sorry for the delay, Tony. 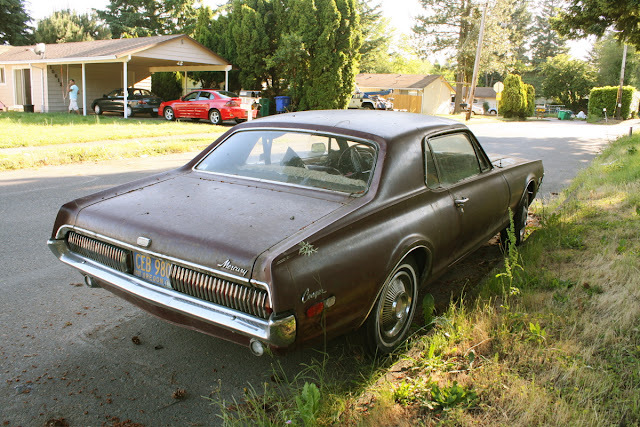 Cougars are basically Mustangs, and there was quite a bit of change in the bodies between '68 and '69 on both cars. As was stated before, the grills and tail lights are different (vertical to horizontal, plus the 69 was full width, not two seperate grills) and the body itself is changed and a bit larger, just like the Mustangs. The '67s and '68s are almost identical, the tip off as to which is which is the side marker lights (the '67 cars, Cougar included, don't have them). Of course, you can always look them up on Google images. Candidate for "best of 2013"
Really great, great images. The patina and paint oxidation is awesome. Love that front grill. Never cared about these cars before, now I think they deserve a special monument in our nations capitol. Vulvanator.......my sides are now in orbit. I laughed HARD. This Cougar has a lot of personality. Great patina. the color, condition, lighting and single non-masked-off "whitewall" tire bear a nauseating similarity to february's glas. at least they pulled off the hubcap before spraying. I had a '68 Cougar - 302. 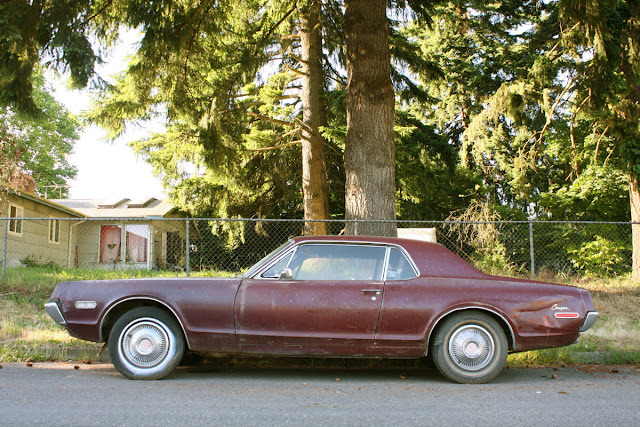 It had seats with leather as thick as a baseball glove, a slew of switches on the ceiling panel (like a 747 cockpit), retractable headlights, and those cool one-two-three tail lights (they used a small motor to fire the bulbs). Hated to let it go, but a guy offered me ten times what I paid for it.